You need to expand the space station and rotate it for gravity.Also make a space dock to build these new ships.Be nice if you could use methane as fuel,because its abundent. If you’re just heating a gas without it being in a chemical reaction, couldn’t you use something like Nitrogen? Abundant, relatively inert, much higher density for storage, and much more mass to be able to eject at high speed = higher thrust (for the same eject velocity). The ION engine used Xenon for essentially the same thrust and storage density gains. But it does hark back to the USAF interest in a nuclear bomber. Some good footage of that on YouTube. @Nathan: Yes, methane would make a very good fuel. There are a number of people and organizations who have made such suggestions in the past, but nobody has yet followed through with building a practical CH4/O2 rocket engine. Cryogenic methane as a quirk or two that make is a little odd to handle, but if those are overcome then there’s much promise. In terms of performance, it’s better than kerosene. In terms of packaging, it’s better than hydrogen. It’s kind of in between the two and so it might enable some interesting missions. @Russell: Very good question. It basically comes down to molecular mass. While it’s been a few years since I’ve played with it, I still have on my computer the old NASA-Lewis Chemical Equilibrium Program CEA from Bonnie McBride and Sanford Gordon. If I stick into that 3000F hydrogen and 3000F nitrogen (and fooling the program just a little in order to make it work) and simply expand it out to a 245:1 expansion ratio, then I get a vacuum specific impulse of about 759 seconds for GH2 and about 208 seconds for GN2. At a given temperature, the lighter molecules of H2 are going to be flinging themselves into space at a much higher velocity. That higher velocity translates to a more efficient momentum transfer via the rocket equation. I tried to mention this consideration in the article itself with the reference to the fact that we run H2/O2 engines fuel-rich but perhaps the connection wasn’t clear. Think about the H2/O2 reaction. At perfect stoichiometric, mixture ratio = 8, your combustion product is H2O (water/steam). At lower mixture ratios, you primarily get a combination of H2O and H2 as the constituents of your exhaust. Now, at stoichiometric conditions, you get your hottest fire, so people naturally assume that that’s where you get your best performance. But that’s not true. The peak specific impulse for an H2/O2 rocket, depending upon chamber pressures and cycles, is somewhere between a mixture ratio of 3 and 4. Why? Because while it’s not the hottest fire possible, I have so much more extra H2 flinging itself at high velocities that I actually get a more efficient momentum transfer despite the overall cooler temperatures. The H2 molecules are much lighter than the H2O molecules. However, as you mention, liquid H2 is very un-dense (fluffy) and a nuisance with regards to packaging. Thus, most launch vehicles that use H2/O2 are sized to a mixture ratio of somewhere between 5.5 and 6.0. That’s still fuel-rich as compared to the stoichiometric value of 8 so you get some of the “free H2” advantage, but it’s not at the best theoretical performance point on the curve. It turns out that a mixture ratio in this range is generally the best compromise between specific impulse performance and vehicle packaging considerations. Great to see this technology still being discussed and tested. 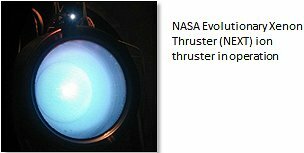 Just how likely is it that we will see a NTR stage for in space propulsion for a future NASA human flight to Mars? I have read it was an option in a previous Mars DRM and the advantages over chemical propulsion were very clear, seems almost a shame not to use the technology. Can we just build and use the NTRs developed back in the 60s or are they too obsolete to even consider using now? This might be a rather silly question, but thinking about all that H2 leaving the rocket unoxidized made me wonder whether a hybrid chemical/nuclear rocket has ever been considered. 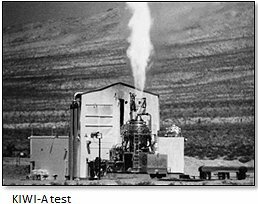 For example, could you feasibly construct a sort of “afterburner” where O2 was injected into the nuclear-thermal exhaust to give a bit of an extra kick, and would it be worth the additional mass? 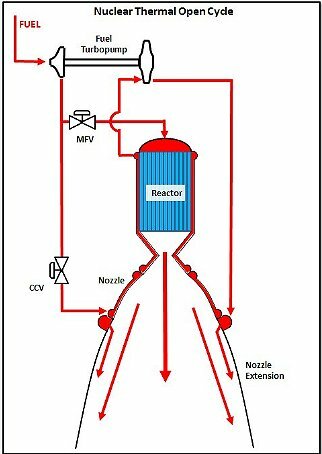 Alternatively, could you use a smaller nuclear-thermal component for an element of a traditional chemical rocket – such as replacing the gas generator? @Ben: It’s been ten years since I was directly involved with this technology. Back then, we were looking forwards through the lens of the aptly named Prometheus Program and, yes, it seemed like a plausible direction we’d be heading. But, programs come and go. The technology (i.e., the physics), on the other hand, mostly remains the same. Thus, the bottom line that nuclear-thermal propulsion is attractive for a Mars mission is undeniable no matter what program symbol is painted on the hardware. The technology that we tested back in the 60’s is, largely, the same technology that we’d use today. What would be different on the rocket side is our knowledge of dealing with hydrogen in general, which was still a somewhat new-fangled propellant 50 years ago, and our standards and techniques applied to analyzing and manufacturing the hardware. Frankly, considering some of the extraordinary engineers I know here at NASA MSFC, designing and building the rocket side of a nuclear-thermal rocket would be like falling off a log. Yes, it would require some work, as all worthwhile things do, but there’s nothing there that should be stretching our capabilities. Now, on the reactor side, I’m not quite as knowledgeable. Back ten years ago one of the biggest concerns was reactor fuel development. It was suggested then that once you choose your launch date that you needed to back up about 10 to 15 years prior to that date and start funding this development activity. That kind of long-term vision and commitment is obviously an extremely difficult narrative to sell, initiate, and maintain in an environment of annual appropriations fights. And, of course, as I mentioned in the article, one of the biggest struggles with the technology is system-level testing. Even if the rocket side design is akin to falling off a log for experienced rocket engineers and even if we get ourselves in good shape with regards to reactor technology, the question remains, how do we test these things such that we can certify them for flight? And, that issue of flight certification is dramatically amplified if you plan on flying people. Can it be done? Emphatically: Yes. And safely. But not cheaply or quickly. This is another facet that requires a long-term vision and steadfast commitment. @Karl: That’s not necessarily a silly question at all, but my tentative answer kind of sounds similar to the response above to Russell. If I run CEA with 2000K hydrogen and nothing else (other than a trace to make the program run) at 1000 psi chamber pressure and a 200:1 nozzle, I get a specific impulse around 770 seconds. However, if I take that 2,000K hydrogen and mix in some oxygen to a mixture of, say, 2:1, yes I do get an even hotter mixture, but my characteristic velocity (c-star) goes down due to the effect of the heavier average molecular weight. The specific impulse drops down to the range of 610 seconds. However, I realize that by doing the calculation the way that I have it’s not really applying the oxygen in an after-burner mode as you suggest, so maybe there might be something there that I’ve lost. It might be something to at least consider looking at more closely. Okay, a back to basics question: Specific Impulse is a measure of efficiency of the engine, but thrust is what does the work, isn’t it? So while throwing H2 out the back at high speed gives higher efficiency, wouldn’t H2O, or CO2 give higher thrust? Karl’s suggestion adds mass and additional heat energy to the exhaust, so logically more thrust (or so it would seem to me). Or is thrust less important in the microgravity of space than on the ground trying to get into space? If you took an optimistic Timberwind-style pebble bed NTR, and again took the optimistic upper bound of Aerojet’s LANTR testing, you could conceivably get an NTR that could almost compete with LH2/LOX chemical rockets and still have isp similar to the 60’s NERVA. You’d basically get an NTR with sort of gears, you could run higher thrust/lower isp with LOX and vice versa without. 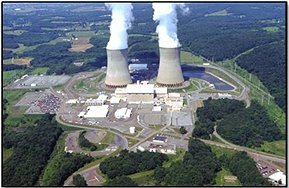 For somewhat safer nuclear reactors, thorium could be used as the nuclear fuel instead of uranium. The fission products for a thorium reactor would decay away much faster than those for uranium. The thorium nuclear reaction is not suitable for creating explosions so proliferation should be less of a problem. Nuclear reactors can provide copious amounts of energy for long periods of time. However, rockets still need to carry sufficient propellent to complete a mission. H20 may not be the best propellent but it is easily found in the form of ice on many celestial bodies. Nuclear rockets might help solve this logistical problem. @Russell: Yes, one can think certainly of thrust as “doing the work” in the Newtonian sense. You are absolutely correct. However, when you’ve got not much else working against you, as is the situation in space, your efficiency in thrust generation (i.e., your specific impulse) is much more important than brute force. Here are the basics in a very simplistic sense for rocket propulsion: (1) when getting off the planet, thrust is king; (2) when moving about in space, specific impulse is king. When you’re on the planet and trying to get off, you have a couple of very significant things working against you. First, you have gravity. It takes a lot of oomph to get a vehicle up and away from the planet, i.e., out of the “gravity well.” That’s why using lower efficiency propellants such as kerosene and solids is extremely useful for the first stage of launch vehicles (think of the first stage of Saturn V or the big solid-propellant boosters on Shuttle and SLS). Second, you have to deal with the atmosphere and all the energy losses associated with drag. Again, the faster that you get up, away from, and out of the atmosphere the better. Thus, going back to Newtonian thinking tells you that big thrust results in big acceleration. From there, basic kinematics tells you that big acceleration means fast transport. Therefore, big thrust translates to minimizing the losses caused by near-planet effects. Now, after having escaped from the atmosphere and having achieved orbital velocity, you’re hanging around “weightless” in space. So, how do you go somewhere else? Well, again you need to accelerate (in orbital mechanics jargon you need “delta-V”), but you don’t necessarily need to accelerate quickly. You’re no longer fighting to get away from the surface of the planet. This is why you can use things like nuclear-electric or solar-electric propulsion systems, which are typically extremely low-thrust options. Yes, Newton still applies: you need thrust to get acceleration. But, you have to remember that with a space vehicle, you’re carrying everything with you. The efficiency of your propulsion system relates directly to the sizing of your overall vehicle. An inefficient thrust generation system means that you need really big propellant tanks. Really big propellant tanks are heavy. Heavy stuff takes more energy to accelerate. And thus you can imagine the compounding effect of lower efficiency thrust generation, i.e., lower specific impulse. When you’re talking about nuclear thermal rockets, you’re usually talking about in-space propulsion. Yes, on rare occasions folks have proposed using nuclear thermal rockets for earth-to-orbit propulsion, but most people are not comfortable with hot reactors being flung around in the atmosphere. So, if you’re talking in-space, then thrust generation efficiency is going to be the key. While some of the ideas presented here could boost thrust, they don’t necessarily increase efficiency. And, in some cases, there’s an additional penalty in terms of vehicle weight. That last point is an interesting one, FYI. The largest part of any launch/space vehicle is propellant storage. That’s an interesting thought. On the front end of a vehicle is complex stuff called your payload. On the back end of a vehicle is complex stuff called your engines. Your payload is your objective so it weighs what it weighs. Your engines weigh a lot, within historical norms, but considering the internal conditions of pressures and temperatures, that’s not surprising. In between these two complex ends are essentially huge aluminum cans called your propellant tanks. The more efficient you can be with this storage of propellants in terms of dry, structural mass versus the mass of your stored propellants, the more successful will be your vehicle. What’s the most efficient structure? One great big hollow shell is quite efficient and that fits the notion of nuclear-thermal propulsion and the use of hydrogen as a single propellant. For a bi-propellant chemical rocket, I cannot use one hollow shell. At the very least, I need two big hollow shells. In terms of the ratio of dry mass to stored propellant mass, I’ve just become less efficient in terms of stored propellants. Now, over the years there have been various tri-propellant rocket engine ideas have been put forward and a couple were suggested here as well. Some are really, really cool and have neato theoretical advantages. But now, if I were to use such a system, I have to store three propellants. My ratio of dry, structural mass to useable propellant mass now just got really bad with three separate storage tanks. This is one of the reasons that tri-propellant rockets have, to date, been research projects rather than practical designs. All these considerations go into the conceptual designs for launch architecture and mission designs. It’s always a tricky matter of balancing between various pros and cons. Thanks for the clarification. Amazing how a second, slightly different explanation helps the first sink in. @Stephan: I understand how reactors work on a very basic level, but I am by no means a nuclear engineer or nuclear physicist. Your comments regarding Thorium are interesting. Perhaps I’ll do some research for my own edification. And, yes, I like your idea regarding the use of nuclear-thermal propulsion with in-situ resources. When I think of nuclear-thermal, I am typically thinking like an engine guy and, as such, I’ll default to high performance and hydrogen as the obvious propellant choice. But taking into consideration overall mission efficiency, the use of extraterrestrial fluids might have distinct advantages even if your specific impulse suffers. Very interesting thought. Taking a step back, that’s always been the problem with space exploration as compared to the great exploration missions of our historical past. When sailors from the Old World arrived in the Americas four hundred years ago, there was lots of stuff that they didn’t have in this new place but there was no question that what they found was lots and lots of raw materials. There was food and timber and metal ores and, certainly at the very least, air and water. The Moon or Mars or Titan doesn’t offer such an abundance of resources. But the degree to which we can utilize what these places do have will help us immensely. If we’d gone ahead with Project Orion, we could’ve got to the nearest star by now. Late to the party, but I wanted to point out that thorium would indeed make a rocket propulsion reactor much safer by preventing it from actually working. Like U238, thorium is fertile; it is far more likely to capture neutrons and eventually transmute to a fissile isotope (Pu239 or U233 for U238 and Th232 respectively). The promise of thorium is as a feedstock to breeder reactors to produce U233 which could be used in space reactors much as U235 (the active ingredient in HEU) has been used in the past. This adds an added element of risk: U235 and U238 are the dominant natural occurring isotopes of uranium because they have much longer half-lives (i.e. are less radioactive) than U232 and U233. HEU is made by concentrating U235 from natural uranium. It’s not appreciably more radioactive than natural uranium; it’s about as dangerous as lead provided it doesn’t begin to fission. By contrast, U233 is extracted from irradiated nuclear fuel. The purification process in’t perfect so there is some amount of U232 in with the U233. That poses a problem because U232 has a really short half life (~70 years vs hundreds of thousands of years for U233, U235, & U238 and it decays to gamma emitters which make it difficult to handle. So even if you migrate to a thorium fuel cycle for some reason and use U233 for your reactor fuel, you are worse off from a safety perspective than using a clean cold core of U235/U238. Also, assuming the argument about actinide and fission product longevity is valid, it’s not really a concern for a space reactor which may have a mission time of a few years. It’s a concern for terrestrial plants but the main radiation risk in space is direct shine from an operating reactor (as explained very well in the original post), not radiation from activation & fission products. I appreciate the interest and enthusiasm people have for thorium, but it really helps to move beyond the hype, learn some basic reactor theory, and understand the characteristics of the dozen or so fissile and fertile isotopes. There are a very limited number of materials suitable for reactor fuels, especially in specialized demanding roles like space power systems and rocket propulsion. It seems like forever ago in grad school learning about NERVA, SNAP-10A, SP-100, the Russian TOPAZ reactor and their other space reactors used on naval reconnaissance satellites (e.g. COSMOS 954). I highly recommend getting a copy of Space Nuclear Power (ISBN-13: 978-0894640001); though dated it’s still a fantastic intro to space power systems and nuclear power systems in particular. Remember – the people who work on these systems are not stupid or shills for Big Uranium. If thorium was a viable option as a reactor fuel (not as feedstock for breeding) , it would have been heavily researched and prototyped. It wasn’t and there’s a very simple reason why: it won’t work. It would be really cool if it did, but physics doesn’t lie. And yes, I actually am a nuclear engineer. But don’t take my word for it — get a used copy of “Space Nuclear Power” and a good intro text on reactor theory (Duderstadt, Lamarsh, or Glasstone & Sesonske). Look for the equations for calculating critical mass (diameter, really) and plug in the most optimistic numbers you can find for Th232. The results will be disappointing but they are what they are.